Our mattress, pillows, and sheets all work together to deliver complete cooling comfort, from head to toe. Our premium stretch-knit cover is infused with a proprietary “Phase Change Material” that absorbs and dissipates heat for a refreshing, cool to the touch surface. The luxurious 100% Egyptian Cotton cover provides superior softness and cool breathability. The firm comfort and support of foam clusters on one side and the plush comfort and support of polyester fiber on the other side. 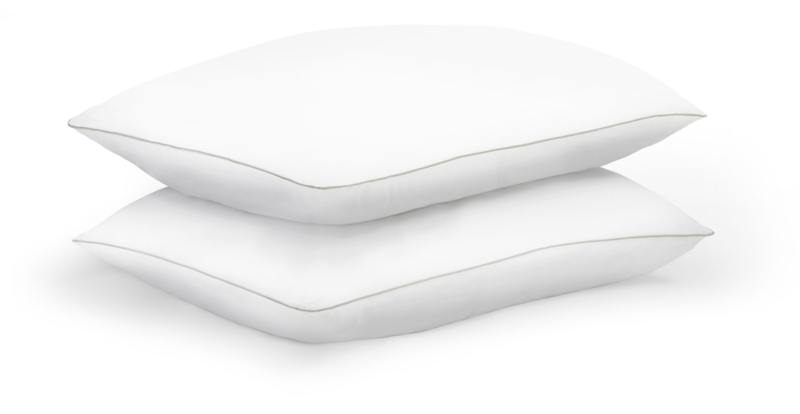 Simply flip the pillow over for a distinctively different level of comfort and support. 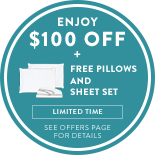 If you order a king mattress, we’ll upgrade your pillows to king size for no additional cost. King mattress purchases will be paired with king size pillowcases. Engineered from heavier, more robust foam to be highly durable and resilient. We’ve tested it, and we know it bounces back every time. Choose from two options—soft, our best selling feel, or firm. Use our scale to find the mattress that best matches your feel preferences. The difference between soft and firm is how much you sink into the bed. Soft feels like you’re “in the bed,” while firm has an “on the bed” feeling. Perfect for those who like to be supported by their bed, but with a cushioned feel. Choose Soft if you fall in the soft to medium range, and prefer a plusher feel. Great for those who require sturdy support from their bed, with a robust feel. Choose Firm if you fall in the firm range, and prefer a denser feel. Your Cocoon™ by Sealy is shipped for free in an easily moveable box that measures 15” x 15” x 44”. Unpack, unroll, and feel the difference for yourself. For questions about our products, check out our FAQs page or give our Support team a call.